My sister deserves to have the wedding of her dreams, not an arranged marriage to some random werewolf. But our Alpha father is trying to force her into marrying someone she doesn't love, someone she doesn't even know. The worst part? She's agreeing to do it so I won't have to. Dodging danger isn't the easiest thing to do lately, after having a run-in with a new kind of evil - one that I never knew even existed until I met Jax. I received Starcrossed in return for an honest review from the authors. Camryn's was worried with her best friend gone her summer would be boring. Instead of boring, she's met a new boy that just arrived in town that she shares a connection with. Her father has returned from a long absence, but he doesn't have the best intentions when he forces her 18-year-old sister to marry. One of the kids from school has been found murdered and all signs point to werewolves involved. Camryn's future is banking on her and Jax figuring a way to break the cycle of her dying. As if that's not enough strange werewolves are hanging around town, and her new friend may not be who she pretends to be. As if she doesn't have enough going on her best friend has returned to town only to find out that Camryn hasn't been telling her everything going on. Will they figure out how to save Camryn's life or will she repeat the cycle once again? What about who killed the student from school? I really like Camryn she's just getting better and better with each book. She's sweet, honest and willing to do whatever it takes to protect those she loves. I like Jax he's a good guy who cares about Camryn but he has some secrets that he's not ready to share with her. In Starcrossed we get to learn more about Mila as well as Zoe and her new marriage and even a little bit of their prior lives. I couldn't wait to dive right in but I knew I had to wait till I had enough time to read cover to cover. 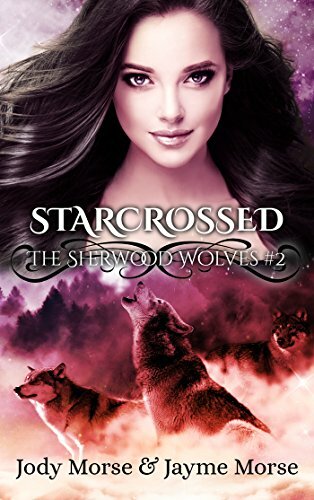 Starcrossed is the 2nd installment in the Sherwood Wolves it starts off right after the end of the first book. While I'm not a huge fan of insta-love it's different for Camryn and Jax as they have had many lives together even if they don't last very long and it works. I read Starcrossed in one sitting unable to put it down until the last page because I had to know what was going to happen next. I love the characters they are easy to connect with you can't help loving Camryn she's adorable. The authors have done an amazing job creating a captivating story that sparks the heart as well as the imagination. I'm looking forward to seeing what happens next with our star-crossed pair.